I'm not reinventing the wheel here nor am I trying to gain entrance to the wildest frat party on campus. I simply want to share the joy that is contained in each multicolored, gelatinous wiggling bear. Last month I was invited to speak on a panel of bloggers at the annual meeting of the NC Specialty Food Association. We had fun talking about how to work with bloggers, what we expect and how to form long-lasting and beneficial partnerships and relationships. We were treated to lunch and got to take one-on-one with many of the producers and owners of products made in North Carolina. As a parting gift, we were all given swag bags with products from some of the guests. The heaviest prize in the bag? 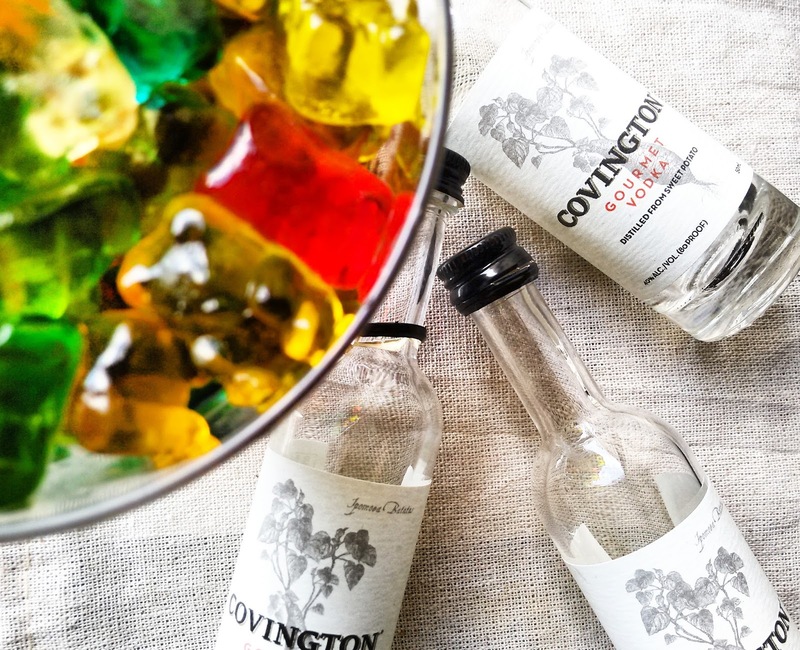 A case of Covington Gourmet Sweet Potato Vodka. A case of 10 airplane bottles. I didn't want to say "box" because that sounds like a mixed bag of anything. Now, I'd had Covington before in drinks and if you know anything about me, you know that I love sweet potatoes. My number one signature dish (right after biscuits) is my Sweet Potato Lasagna. It's classic. What's also classic is how smooth this vodka is. According to the FDA, vodka is a neutral spirit made and it must be clear and tasteless. Meaning, it should taste like water. In order for vodkas to stand out, distillers have been making "flavored" vodkas or using alternative vegetables and grains to set themselves apart from the rest of the industry. Enter in "the best yam vodka in the planet". Made in Snow Hill, NC, Covington Vodka is smooth, with a creamy finish (if that's even possible) and it doesn't feel like you swallowed liquid fire when you've finished. It's local and easy to find in the ABC store. So about these gummy bears? Well, I was looking for an interesting yet fun use for my little bottles and I'd never had a boozy gummy bear, worm, shark or apple ring so why not? In as little as 10 minutes you're off to boozy bliss after you soak the gummies. You don't want them to melt away into oblivion so don't marinate... macerate? them for too long. Overnight is good enough. As far as ratios go, I used 1lb of gummy bears and 150ml or 3 airplane bottles of vodka which is equivalent to 3/4 cups of vodka. You want to make sure the gummies are completely covered by the vodka. If you're lucky, you'll have fruity flavored vodka residue when all of the gummies are eaten. So get ready to soak those gummies, garnish those drinks, add them to adult snack time (OMG wouldn't they be GREAT on a snack bar themed party tray?) and tell me how you like them. Sounds like fun! A pretty cool adult snack!! This is a super fun idea!! Love it! My friend made these for a party and they were a huge hit! SO fun! It's funny you mentioned frat parties as that was my first thought haha! 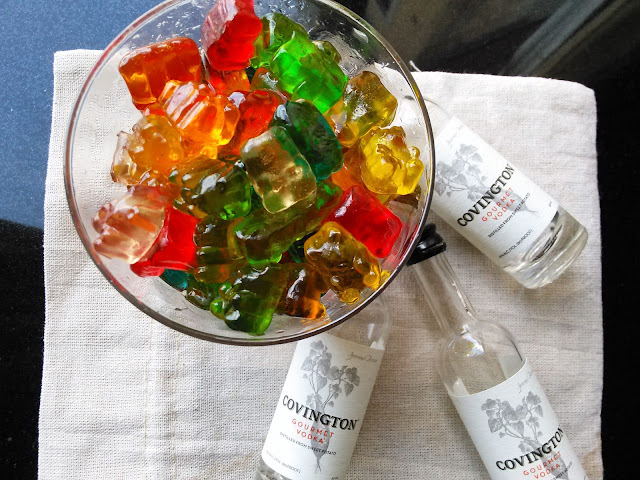 Similar to jello shots, or something, but who can resist vodka soaked gummy bears, I ask?! What a fun, creative idea! So the gummies actually absorb the vodka? I wouldn't have thought they would, so I'm really glad to see this. I have a friend who would LOVE, LOVE, LOVE this idea. I need to make them for her! Thanks for sharing this! Oh my goodness! 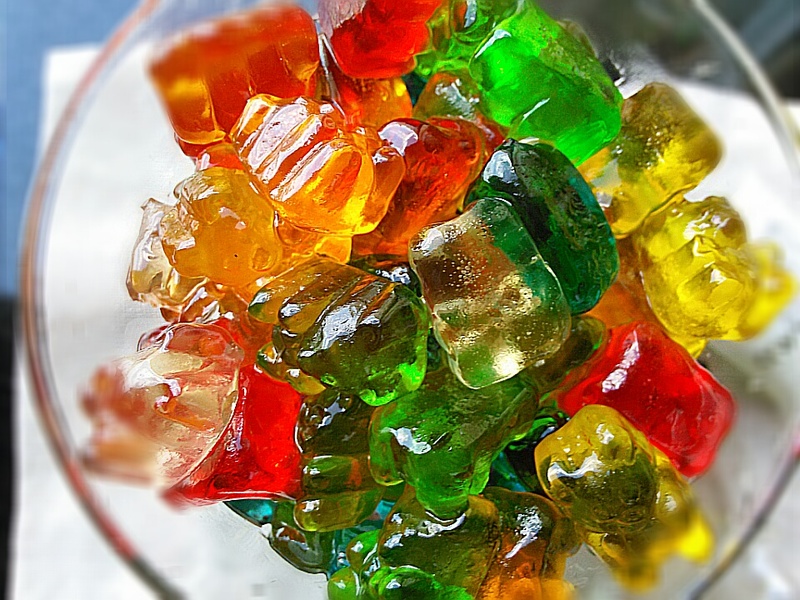 I love these little wiggling boozy bears...yum!